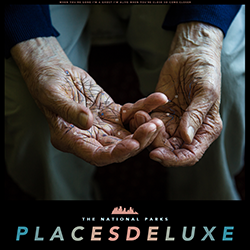 Today, the eclectic 5-piece ensemble hailing from Provo City, UT — The National Parks — release the extended version of their 3rd studio LP, Places Deluxe. Review copies are now available upon request. The band already has the credibility under their belt, they’re just waiting for the notoriety they deserve and hope to make their biggest musical statement yet with Places Deluxe. Upon the release of their debut LP, Young (2013), the band climbed to #13 on the iTunes Singer/Songwriter chart and with their sophomore record, Until I Live (2015), the group became a Billboard Regional Heatseeker. It may be worth mentioning that both of these records were released completely independently. Even still, The National Parks are quickly amassing a rabid following on Spotify, with over 450k monthly listeners and total streams now exceeding 20 million. Places Deluxe welcomes 5 new singles into the mix, including 2 unreleased songs (“Come Closer” & “Penny”), acoustic reworkings of “Esperança” and “Currents,” as well as a dance-floor ready remix of the sensational single, “At The Heart.” Keeping true to form, The National Parks once again independently released Places, and in the first month, the record had been streamed more than 1,000,000 times on Spotify alone, with individual tracks landing on major Spotify playlists like Pop Chillout, Indie Pop and Morning Commute. The initial success of Places inspired the record’s deluxe iteration. The National Parks create atmospheric and “anthemic indie-folk as boundless as their name would suggest” (Paste Magazine) centered around male/female harmonies backdropped by guitar/piano/violin instrumentation. The band’s earliest touring was done as a three-piece but as the music has evolved, so has the band. A wide cast of musicians have joined as touring members of The National Parks but by 2015, the group had settled into a consistent five-piece setup with original members Brady Parks(vocals/guitar) and Sydney Macfarlane (vocals/keys) playing alongside John Hancock (guitar), Cam Brannelly (drums) and Megan Parks (violin). As the principal songwriter, Brady Parks pens catchy stadium-rock singalongs like “Places” and “Lights In The City,” while also using the project as a way to process major life events. Take “1953,” which was heavily inspired by the life of his grandparents and the onset of Alzheimer’s. As far as the deluxe release is concerned, the addition of acoustic reworkings of “Esperança” and “Currents” elegantly showcases the musicality of the five-piece, while “At The Heart” (Saint Black Remix) aims to draw in a new group of listeners. Places touches on the transient existence of a curious wanderer, and as a name like The National Parks suggests, the visual component is never absent, nor is the interconnectedness of one’s heart to the wondrous world around.